I felt a sudden burst of nostalgia when this work first caught my eye. It is pretty clear why; this assemblage piece is mainly made out of toys, which are easily connected to the idea of childhood. The work is very colourful, but all the colours are slightly faded. I do not know if this is because of the age of the work, or if he used these slightly faded colours on purpose. Maybe it was the light of the museum. The work consists of tiny plastic objects, which are partly covered by an orange layer of more plastic material. Two donut-shaped objects are attached to the orange layer. The orange layer reminds me a lot of a life vest. This life vest association gives this layer another layer of (probably unintentional) meaning. 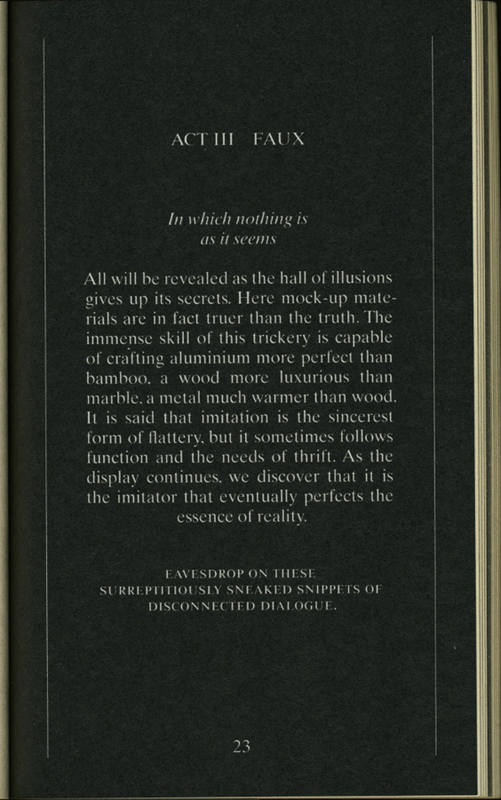 The whole assemblage is attached to a piece of wood, which makes it look more like a painting then like an installation. The Stedelijk museum apparently thinks the same, because the work is classified as a painting. The toys are put in order by their colour, which makes the work almost satisfactory to look at. I start to wonder what kind of objects are hidden underneath the parts that are covered. Where did the artist get these objects from and why did he choose these specific objects? The work reminds me a lot of a dream I used to have as a child; a swimming pool completely filled with toys. I realize that this is the main reason why the work is interesting for me, and why it made me feel nostalgic. After making up all these associations I looked at the name of the piece. The piece is called Mondrian Secret. And suddenly, the whole work changed. 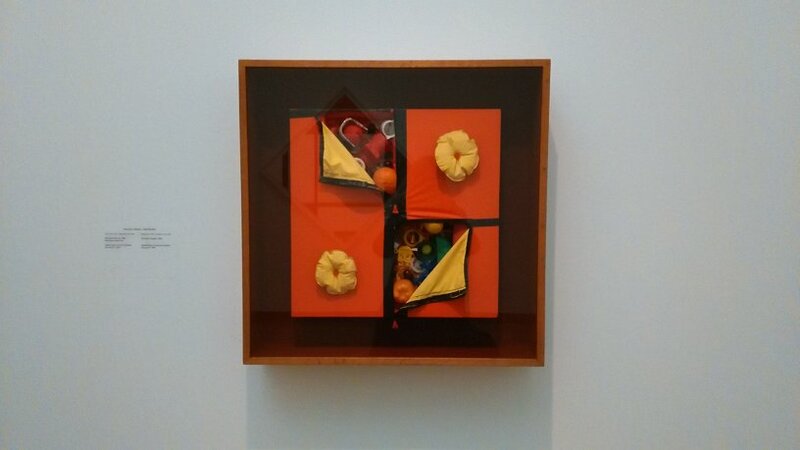 The orange layer is representing the painting, and the toys are the secret insides of a Mondrian painting. The painting is faux, because it hides the true nature of the work. The creator of this piece is Michael-Angel Cárdenas, a Colombian-Dutch artist. The media he uses varies a lot, from drawings and paintings to video installations and assemblages. He is the most well known for his video work. When he came to the Netherlands in the early sixties, he brought with him a lot of new developments in arts. Art movements like New Realism and Pop Art where not really active in the Netherlands. Important themes in his work are sexuality and his Colombian background. If you want to read and see more of the artist, read this article or watch this catalogue. 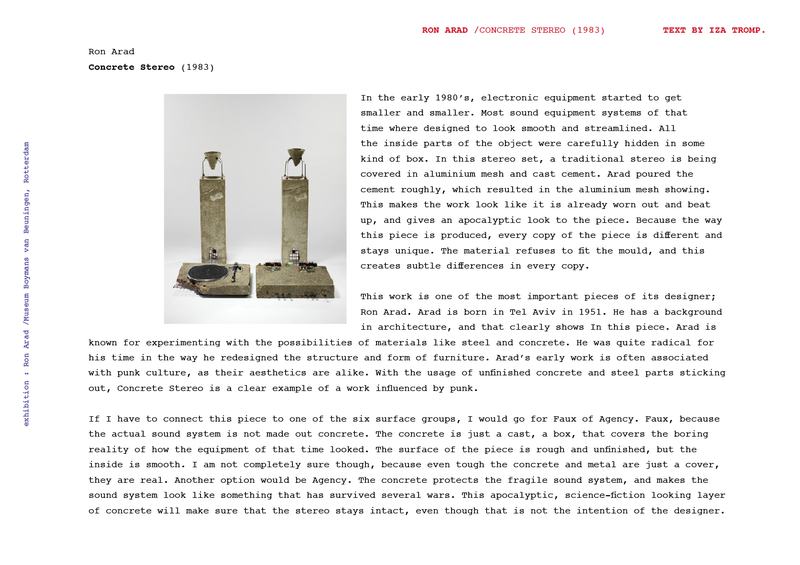 Earlier, I wrote a post about Ron Arad’s Concrete Stereo. A similarity between Mondrian Secret and Concrete Stereo is the way the surface is approached; both are covered up or hidden by a different material than the core of the work. In Concrete Stereo, the fragile sound system is hidden by a thick layer of rough concrete, giving the work another meaning and feeling by adding a layer. In the case of Mondrian Secret, the playful toys get hidden away by a layer, that is representing a painting that already exists. In the case of this work, the meaning of the actual Mondrian work its referring to changes. We associate Mondrian’s work with mathematical precision. Cárdenas’ interpretation hides a layer of playful, colourful plastic toys. The surface of the painting is supposed to represent something that hides the “true nature” of the painting. A bunch of toys and plastic objects, organized in order of the rainbow colours. Put together with the same precision as Mondrian painted.